BASSETERRE, St. Kitts, CMC – A maiden first-class hundred from West Indies Under-19 World Cup hero Kacey Carty failed to stop Windward Islands Volcanoes from a seven-wicket victory over Leeward Islands Hurricanes in the Regional 4-Day Tournament on Monday. 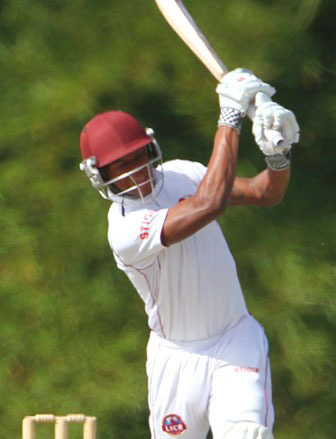 The 20-year-old St. Maarten-born Carty struck 103 to add substance to a Hurricanes second innings total of 351 before the Volcanoes successfully chased 52 for victory on the final day of the eighth round match at Warner Park. The result meant the Volcanoes earned 20.8 points and completed the season double over the Hurricanes, whose season aggregate increased by a mere 3.4 points. Carty was the Player-of-the-Match winner in the Final, when the Windies Under-19s lifted the ICC Youth World Cup last year in Bangladesh. He has struggled to make a huge leap from junior to senior cricket, but he collected nine fours and four sixes in his 178-ball knock spanning just under four hours to lead a show of defiance for the Hurricanes and suggest he may just now be coming to terms. Jahmar Hamilton and Rahkeem Cornwall made 43 apiece, but discarded West Indies off-spinner Shane Shillingford snapped up 6-114 from 34.4 overs, finishing the match with figures of 12-192, to bowl the Volcanoes into a winning position. The Hurricanes resuming from their overnight total of 105 for two reached 222 for four at lunch with Carty in sight of his milestone. Montcin Hodge showed great restraint during the morning period and shared 84 for the third wicket with Carty before he was caught at forward short leg off Shillingford and Nkrumah Bonner was caught at cover off Liam Sebastien’s off-spin in the final hour before the interval. After lunch, Delorn Johnson dropped Carty, on 85, at mid-wicket off Sherman Lewis, clearing the way for the young batsman to proceed to his hundred which arrived when he added insult to injury by crashing the same bowler through cover for his last boundary to reach the landmark. Kyle Mayers soon had Carty caught at mid-wicket to end the young batsman’s fourth wicket stand of 67 with Jahmar Hamilton, whose dismissal triggered a decline that saw the Hurricanes lost their last five wickets for 55 in 51 balls. Tyrone Theophile batted with carefree abandon to hasten the Volcanoes to the finish line, but Cornwall grabbed 3-23 from 7.4 overs with his off-spin to make them wobble a bit. The Volcanoes host fellow eighth-round winners Jamaica Scorpions in the next round at the Arnos Vale Sports Complex in St. Vincent, starting on April 7, but the Hurricanes will be sidelined for that weekend, due to three One-day Internationals between West Indies and Pakistan being played at the Guyana National Stadium, pushing back their scheduled ninth round match against Guyana Jaguars until April 21 at the same venue. The Hurricanes face Trinidad & Tobago Red Force next time they take the field on April 14 at this venue for what was originally scheduled to be the final round.